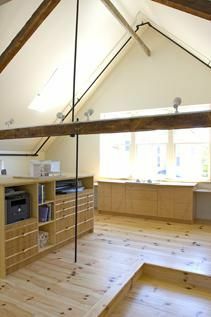 Existing barn beams and pine flooring combine with contemporary furnishings to make this architectural design studio a unique combination of old and new. This office space was conceived and constructed with its occupants' well-being in mind. From the abundance of natural light and the thoughtful layout of workstations to the virtually emissions-free cabinetry and finishing materials, the studio is a healthy pleasant and efficient place to work. Caramelized bamboo flat file drawers are oversized to accommodate drawings and functional sculpted maple integrated pulls add contrast and style. 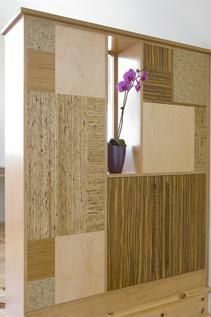 The unique room divider was built with environmentally friendly wood products. It creates an attractive display piece that helps clients visualize these materials in their projects and provides additional bookshelves and cabinet space. 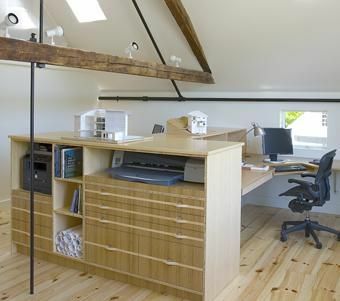 Dimensions: Office space designed to accommodate existing features in restored barn.